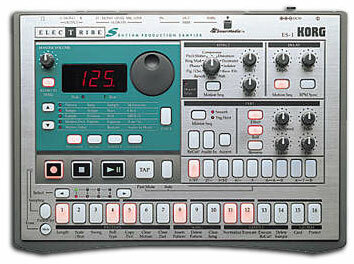 The E-MU Emulator II Omi “Universe of Sounds” Libraries are some of the BEST 80’s samples I have ever heard. What’s great about the 3 volume library is that it covers just about every sound imaginable for that 80’s synthpop sampler sound. Last week I found a used E-MU Emulator II here in Japan that unlike other gear I have found is in pretty rough shape. It’s currently not working but the good news is that it has potential and hopefully very soon I’ll have it back into shape. Luckily I found 3 brand new boxes of 5.25 floppy disks as well to feed this beast. I never thought I’d be using those disks ever again…laugh. OMI EII Universe of Sounds Volume 1 – Fantastic collection of samples in this volume. OMI EII Universe of Sounds Volume 2 – Superb! OMI/Northstar EII Universe of Sounds Volume 3 – Lots of great SFX in this one. For now I am collecting both E-MU Emulator II and EMAX II sounds ( another great sampler ) for later use in my newly acquired Emulator II. I also have been extracting some of the WAV files for importing into one of my favorite samplers, the Roland S-760. From there I can then sample sounds into either the Roland S-50 or S-330. Of course the samples are not identical sounding as you would get out of the Emulator II, but it does allow me to use the samples and explore them while I get the Emulator repaired. I really like these old hardware samplers. I find the limitations they have to be quite challenging but at the same time very rewarding. I also find tinkering with these old samplers to be quite nostalgic as I grew up in the 80’s attending elementary, junior high, and high school during that decade. When I listen to the old samples, they really remind of that time and a great time it certainly was. At the same time it will be fun to try and create new ideas and songs out of these samples as well. After all, these vintage samplers cost a fortune back in the 80’s and it’s only taken me 20 plus years to get my hands on a few…laugh. Hopefully I’ll have my newly acquired E-MU Emulator II up and running soon. For now though, I’m having fun sifting through all these great sounds of the past and enjoying what they have to offer now and into the future. Note that the E-MU Emulator II had some great presets as well as some other great libraries that I’m currently checking out. I’m not up to speed with all the past releases and producers of the E-Mu Emulator II Sample Series Libraries, but I’m learning really quick thanks to some great forums and of course the Yahoo Groups. Lots of reading! Here is a demo video found on Youtube of the E-MU Emulator Sampler in action. Last weekend I struck GOLD finding “two” mint condition Roland S-760 samplers for $20 each! One of the Roland S-760 samplers had the Roland OP-S760-1 Video Output expansion board installed. When I walked up to the counter to purchase the two S-760 Samplers, the sales clerk went into the back room and came out with a plastic package. Inside were two original Roland OS V2.0 disks, power cords, manuals, and a mint condition Roland MU-1 Mouse!! I couldn’t believe it. The ever elusive MSX MU-1 Mouse was a part of the package. I had been looking for this Roland Mouse for ages and never could find one. I currently own a Roland S-50, S330, and W30 but always had trouble finding a MU-1 compatible mouse that had a “reasonable” price tag on it. So for $40 bucks I found two Roland S-760 samplers and all the goodies included. It was obvious the sales staff had no idea about how much accessories can run for these old vintage Roland Samplers. I brought home the Samplers, plugged them in, and they both worked beautifully. The Roland MU-1 mouse was a dream to use and if you don’t have one already, they are extremely useful. About a month ago, I bought a used Sotec computer in Japan with Windows XP SP2 installed. The Sotec computer had an S-Video and regular RCA Video input jack in the back. I was able to easily connect the Roland S-330, S50, or S-760 to the computer and get a really nice looking display of what’s going on inside these samplers. Attached is a video found on Youtube of another gentleman doing something similar with the Roland S-760. The catch though is that you need the Roland MU-1 mouse to really navigate more easily through the menus. 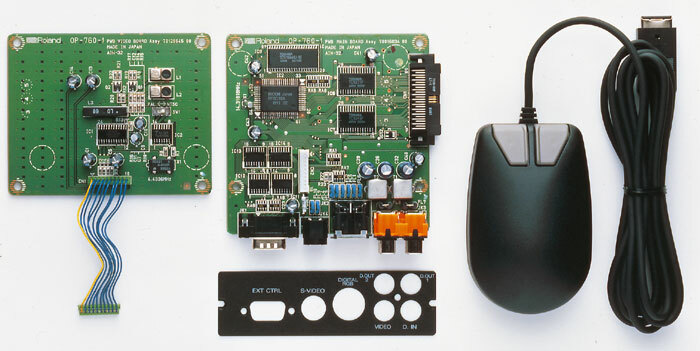 Plus the Roland S-760 does not have the Video Output or the Mouse Jack without the OP-760-1 expansion board installed. The Roland S-330 and S-50 have it by default but you still kind of need the mouse for easier navigation. I also picked up an old casio portable analog LCD TV that had video-S and regular video connections. Portable analog LCD TVs are very cheap in Japan since they converted 100% to digital in 2011. Now is a great time to find and buy these TVs as many are dumping them in used stores. They work great for small portable screens that can be connected to these samplers. They are just big and clear enough to view the data perfectly. Plus they are rechargeable and easy to carry with you or put in a gig bag. I use one especially for the Roland S-50 and it’s awesome. The Roland S-series samplers are really fun to work with despite some of their drawbacks. Finding that MU-1 mouse was huge for me because it now makes working with these samplers on computers much easier. I’m now on the lookout for a Roland DT-100 and RC-100 controller. I also have the Roland S-330 SYS-333 Director-S software, but am in need of the Roland S-50 SYS-503 Director-S. If anyone out there has one they’d like to sell, please contact me. I’d be very interested in buying it if possible. Thanks! 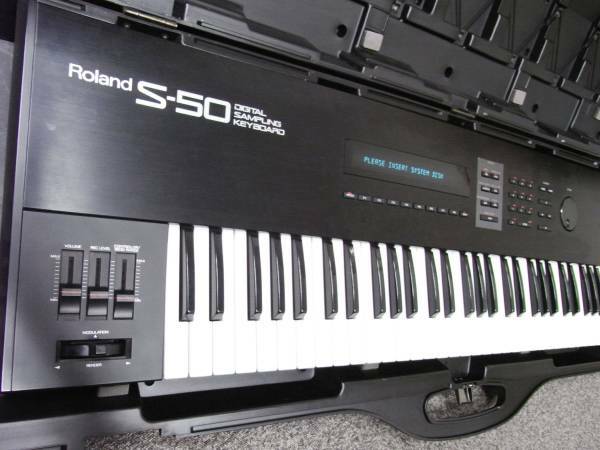 I also may pick up a Roland S-550 one of these days if I ever find one in Japan. Had an amazing day at the used music shop today. 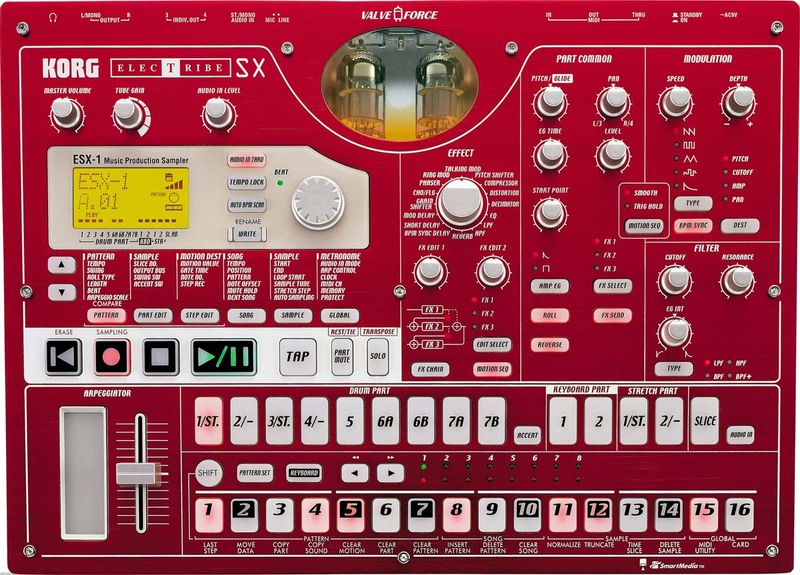 I strolled in not expecting to find anything and walked out with a free Roland S-50 Sampler. The sales clerk in the store knew I liked and worked on old synths so he figured I would find a good home for it. 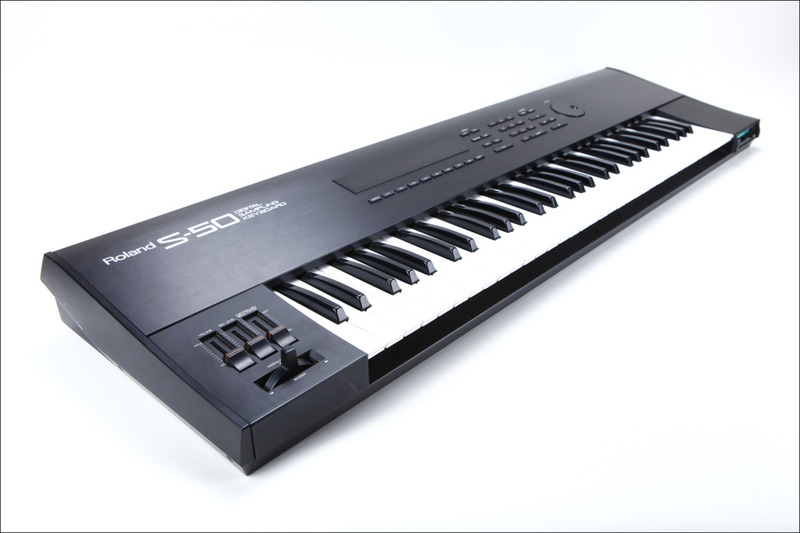 The Roland S-50 had several issues which from his perspective seemed hopeless. First, the Roland S-50 had no operating system disk. He didn’t think you could get them and he certainly didn’t know how to get them from the internet and create a new one. The S-50 also was rather filthy cosmetic wise and seemed like it was in crappy storage for quite a while. It powered up beautifully though and I later found out the floppy disk drive works great. There were also lots of stickers all over it which had autographs on them but none were famous. When I brought the S-50 home I gave it a good cleaning and removed all the stickers. It looks good as new now. The sales clerk didn’t think the sampler would sell at all due to the OS and grime so he gave it to me for helping with some English translation stuff. Later at home I managed to create a new Roland S-50 V2.0 OS disk and the sampler booted up perfectly. I also have a copy of the S-Director Sequencer software for the S-50 in addition to almost the entire collection of S-50 disks. I also found an old CRT monitor to hook up to the S-50 which is essential to further editing of the samples. It came with a cool Roland hard shell case which will fit my second Roland D-50 perfectly. I really like those stock Roland hard shell synth cases. I’ll probably have to later open up the Roland S-50 and give it a good internal cleaning but for now everything works great. In addition, I’ll probably attach the second HxC Floppy drive emulator that I have in order to use the S-50 without floppies. That should be great to rotate through a large number of sample images. The sound of the Roland S-50 is really excellent. I am a HUGE fan of the Lo-Fi samplers of the later 80’s and early 90’s. I know the Roland S-50 is not the most popular of the bunch, but with my setup and multitude of samples, it suits me well. One thing I really like about the S-50 is that it’s super quite when powered on. My Roland W-30 is noisy with the power inverter that hums when running. It’s annoying to listen to that all day. The S-50 doesn’t have that noise which is utterly fantastic. My early Roland sample gear now consists of an S-50, S-330, S-760, and Roland W-30. All are fun and interesting in their own unique way. Wow! I just picked up a used Ensoniq EPS Classic in fantastic condition today for real cheap. The EPS Classic had been sitting in the used shop for a couple of months in the junk bin and still nobody had bought it. A couple of days ago, I asked the clerk if I could plug it in and give it a test spin. He said that the EPS Classic made no sound and that it would only work as a Midi Controller. I didn’t have the time to talk about it with him, but I figured I would come back and try again later to test the ESP. Well, today I had some time to visit the used music store and this time a different sales clerk was working. This time, the sales clerk allowed me to start up the Ensoniq Classic EPS. He said he had no idea how it worked and thus it was the reason why it was in the junk bin. There were about 65 floppy disks and quickly I was able to find the OS startup disk. I did some homework about this sampler so I kind of had an idea about how to get it going. I powered up the EPS Classic and everything booted just fine. I then found a Moog Disk and loaded up a Moog Instrument in the first bank. I found that the headphone jack was the right plugin jack so the sales clerk allowed me to use the store’s headphones. It took me a minute to figure out how to access the Moog instrument I loaded up, but sure enough I found the sound. Wow! Did that Moog sound fantastic. Instantly I knew I had to have this EPS Classic Sampler. I can’t explain it, but it’s the sound that just clicked with me. It definitely sounds different than my Roland W-30 or S-330 Sampler. It has that old school sound which really reminds me of the 80’s. Along with the Ensoniq EPS Classic, I got an Ensoniq pedal, case, manual, 65 disks, and the 2x Expander hooked up in the back of the sampler. The keys are all in terrific shape and work very well. I’ve actually heard a lot of great things about the Ensoniq EPS Classic especially the sound and sequencer. Indeed the sampling time is very small but the loading times and sample swapping are very fast. In fact, I already have plans to use the EPS Classic with my Boss RC-50 and loop sounds as I play them. I can then load up new sounds and record on the fly. My Roland W-30 would be a little slower in doing this, so I’m curious how the EPS will work. I think the EPS should be fun for some creative new ideas. I don’t know much about software or other editing utilities for the Ensoniq EPS Classic, but I’ll be looking into that this week. I’m hoping to find a way to create disk images with Wav files so that I can use them with the HxC SD Card Floppy Drive Emulator that will work with the ESP. I actually just got my second HxC Emulator in the mail today and plan to set it up eventually with the EPS Classic. There is a guy on Youtube below who successfully was able to install the HxC SD Card Emulator with the Ensoniq EPS Classic. I just did it with my Roland W-30 and S-330 Samplers, so I’m confident it will work. Update: On Win98, I installed a program called EPSdisk that allowed me to copy Ensoniq EPS Floppy Disks into .GKH image files onto my PC. I was then able to open the .GKH files in AWAVE Studio using my Windows 7 PC. I also was able to effectively make backup copies of the EPS Classic OS. When I bought the EPS Classic it came with OS version 2.20. I downloaded and made a new OS Disk for version 2.49 using EPSdisk. The EPS Classic loaded the udpated OS 2.49 version just fine. The Ensoniq EPS Classic OS v2.49 fixes COPY FLOPPY DISK and adds several SCSI and Sequencer functions. Furthermore, I found that I could import wav files into AWAVE Studio and create and instrument file. This instrument file could then be saved into .efe EPS Instrument Format and then be saved to an EPS Classic formated floppy disk using EPSdisk very easily. This is my ticket now to importing WAV files of my own into the EPS classic. I actually did this with some example wavs and it worked perfectly! Once I found ESPdisk and discovered that AWAVE works with EPS Classic .efe and .gkh formatted files, I knew it would be easy to import WAV files. Excellent! By the way, I found that my Ensoniq EPS Classic is now running OS 2.49 with Rom Bios version 2.0 and Keyboard version 2.10 using the Software Information Command on the EPS Classic. Another interesting tidbit I found with the Ensoniq EPS Classic is that I had to run two high quality cables out from the left/right output jacks and into my decent Yamaha mixer to effectively get a clean sound out of the EPS. Tweaking the gain, high, mid, and lows, I was able to get a very quiet, clean, along with a very solid punchy sound. Some people experience lots of static coming out of the output jacks. I sense this is perhaps mainly due to the fact that you might need to run the EPS through a good mixer with decent cables. The EPS sampler will make a small amount of noise due to it’s characteristics and also because the output is slightly lower than more modern samplers. However, it’s easily adjusted when using a good mixer. At least it worked great for me. I’m getting some really great analog oriented sounds now and it’s awesome!! My EPS Classic is definitely very phat sounding now. The video below shows a guy on Youtube opening up his Ensoniq EPS sampler, removing the disk drive, and replacing it with an HxC SD Floppy Emulator. Frankothemountain is a Youtube user that uses the Ensoniq EPS Classic on most of his early music. I really liked some of his songs and emailed him about some more info. He said he had four EPS Classics and indeed he used them extensively on his recordings. He said it required “lot’s of looping, editing, and down sampling” but the creative possibilities were endless. It’s a very inspiring Sampler Keyboard. You can check out one of his songs and videos below.